UFO sightings, especially recent ones are reported by MUFON (Mutual UFO Network) and other similar organizations. UFO reports are so plentiful that the last 20 UFO sightings found in MUFON's database took place over the course of one or two days. Some witness accounts of strange objects have more credible evidence than others, while many seem to offer compelling data suggesting humanity is not alone in the universe. According to The Hindu, a bank officer in Chennai, India spotted five specks of an orange-colored light moving through the sky at around 9 PM. He claims they were there and then disappeared in a matter of seconds. Other family members as well as some neighbors also witnessed the event. No photographic evidence exists, although the executive director at the Tamil Nadu Science and Technology Centre speculated what the man and his family saw were meteors. The Huffington Post reports that a tower camera at the local ABC affiliate recorded a strange, twinkling acorn-shaped object in the sky at around 6 AM. The object had black striations running vertically across it. For 45 minutes the object remained there, changing colors. As the sun came up, the object disappeared. A local college physics professor suggested the object was a government aircraft of some type, while MUFON reported that a similarly shaped object had been reported about 200 miles away in Lee's Summit, Missouri earlier that morning. The meteorologist at the news station speculated on the air that the object was a refraction of light through the camera's dome. August 11, 2014 in Houston, Texas was a dark and stormy night. That's why the oval shaped circle of lights hovering below the black rain clouds caught one sky watcher's eye. According to the International Business Times, the photos taken of the strange oval objects with blinking lights showed up all over Twitter. The Houston Chronicle reported the phenomena with a quote from MUFON volunteer chief inspector Fletcher Gray, stating that the most likely explanation was that the sighting was merely an outdoor street light with a ring of lights reflecting off the car window through which the image was captured. However, other reports suggest multiple people saw and took pictures of the UFO. Stephanie Wilkerson of Paxton Township sat on her front porch on August 24, 2014 enjoying a glass of wine when she spotted an object in the night sky, according to Mysterious Universe. As Wilkerson, her husband, and a neighbor viewed the object through binoculars, it changed colors. Wilkerson phoned the police, who spotted multiple glowing objects in the sky. Several police officers witnessed the objects and checked with the two nearby airports. Both airports reported no aircraft in the vicinity. According to Good Morning America, Wilkerson captured the flashing multi-colored lights on her cell phone as a video. While no explanation has been offered by official sources for the lights in the sky, Wilkerson says she's now a believer. If one person notices a spot in the sky but no one else does, the report may be less credible than if many people do. That's why the October 28, 2014 mass sighting of a UFO over the skies of Breckenridge, Colorado is so interesting. On that day, just before noon, multiple people reported that they saw three lighted objects in the sky. The lighted objects arranged themselves in multiple formations. They also appeared to hover in place for about 15 minutes before taking off in a flash at very rapid speeds. Although no official explanation exists for the mass sighting, some speculate that the objects seen in the sky were drones. Witnesses to the event, however, remain unconvinced by this explanation. The United States isn't unique in having UFO sightings. In fact, they occur all over the world. On November 11, 2014, an airplane passenger in the skies over Iran spotted a round, glowing object out the plane window. The object was flying below the plane, and appeared to zip through the sky, according to the Daily Mail. The man recorded a 34-second clip of the strange object, which moves through his field of vision. Speculation is that this UFO is actually an Iranian military drone. A television crew filming at a construction site in Lima, Peru spotted a strange sight in the sky while they were at work. According to the Huffington Post, the television crew filmed the saucer-shaped UFO, which was colored purple in the middle tapering to black at the ends. Witnesses reported that the object remained for two hours, with no mention of how it disappeared. MUFON representatives suggest the object may have been a drone or a kite. 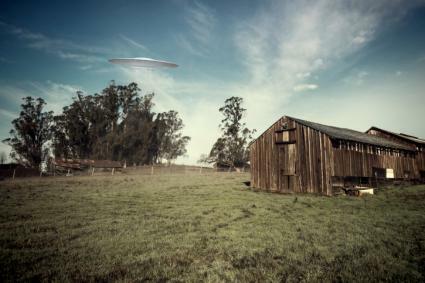 Unlike reported alien abductions, UFO sightings are quite common. Since UFOs appear all over the world, you don't need to go any place in particular to spot them. All you have to do is keep your eyes on the night sky and look for something unusual.